By: Mamaissii Vivian Hunter Hindrew, M.Ed. From the outset, it must be emphatically stated that the name Mami Wata is plural, meaning it refers to a pantheon of ancient water deities. Mami Wata are not part of the Yoruba pantheon of Orishas (i.e. Yemoja, Oshun etc. ), nor are their initiation ceremonies or means by which they are identified the same. The priesthood of Mama Wata is overwhelmingly matriarchal, meaning that the Mami Watas are a part of the old African matriarchal, sacerdotal religious systems that once ruled and denominated Africa and many parts of the ancient world for thousands of years. The mystical pantheon of Mami Wata deities are often pictured in their most ancient primordial aspects as a mermaid, half-human or either half-fish or half-reptile. Mermaids are not a recent phenomena in African history. For example, according to the Dogon’s creation myth, they attribute the creation of the world to mermaid/mermen like creatures whom they call Nommos. They claimed to have known about the existence of these mermaid-like divinities for more than 4000 years. Also according to Dogon mythology, the ancient home of these (originally crude) reptilian (half-woman/half-men/fish) pantheon of water spirits is believed to be […] Sirius (or Sopdet, Sothis), more popularly known as the “Dog Star” of Isis. When asked where their ancestors obtained these stories of mermaids and mermen, they quickly point to ancient Egypt (Griaule, 1997, Winters 1985, p. 50-64, Temple 1999, p.303-304). More contemporary stories and images show the deity as a human-like figure dressed in the latest fashions. Despite these manifestations being almost universally female in appearance, Mami Wata is actually a pantheon of water deities consisting of both male and female, such as the ancient Densu in the Togo Mami Wata pantheon, and Olokun of the Yoruba. These deities are understood to be non-human, so those who are born and initiated to them consider questions of gender and race unimportant. Today, the most frequently encountered image of Mami Wata is a long-haired woman with a snake circling her torso, based on a 19th century chromolithograph of a snake goddess. [The] image created by an artist from Hamburg, Germany named Schleisinger, was actually inspired by the ancient imagery of Isis (rt) in her role as “Virgin (meaning unmarried) Mother” where she is sporting the young solar child Horus. This iconography is considered the oldest manifestation of Mami (Isis). Just as the ancient African, Ishtar, Cybelle, and Hathor, Isis was originally portrayed with braided hair accompanied by two serpents draped around her neck. To the ancient Egyptians, she was known as RENN, meaning “born from the place of the fishes”, and her son Horus, was known as “RENNU,” meaning an “unnamed fish/serpent child.” (Massey 1994, p. 238). The name “Mami Wata,” was believed by Western scholars to be a derivative […] of the two words “mommy/mammy” and “water.” However, though phonetically similar to the English words, the name “Mami Wata” does not have its linguistic roots nor any cultural, mythological or historical origins in the West. Mami Wata are ancient, African deities whose primordial origins and name can be traced linguistically through the languages of Africa. According to some renowned scholars, the name “Mami Wata” was originally formulated in ancient Egypt and Mesopotamia, and is derived from a composite of two African words, “Mami,” and “Wata.” Both words are rooted in the ancient Egyptian and Ethiopian (Coptic), Galla and Demotic languages. “Mami” is derived from “Ma” or ”Mama,” meaning “truth/wisdom,” and “Wata” is a corruption of not an English, but the ancient Egyptian word “Uati,” (or “Uat-ur” meaning ocean water), and the Khosian (“Hottentot”) “Ouata” meaning “water.” Further, we discover from Mesopotamian myths that the first great water goddess in the story of the Creation Flood was known as “Mami,” (Mami Aruru) as she was known in ancient Babylonian prayers as being the creator of human life (Dalley 2000, p. 51-16, Stone 1976, p. 7,219). “Uati” is perhaps the first of more than ten thousand appellations of Isis (logos/wisdom) in her oldest generative form as the Divine African Mother, or Sibyl (Mamissii/Amengansie) prophetess. Furthermore, Massey (1994, p. 248) informs us that the word “Wata, Watoa, Wat-Waat” which means “woman,” are all exact spellings in the ancient Sudanic languages spoken by the Baba, Peba and Keh-Doulan groups. In ancient Egypt, Uati was Isis’ oldest appellation, and was the first Mami goddess worshiped by the Egyptians as “the Holy Widow”, “the Genitrix,” the “Self-Creator”, “the one who reigned alone in the beginning”, “the one who brings forth the gods,” “she who was mateless”, and “the Virgin (meaning ‘unmarried’) Mother.” Thus, we have Isis originally worshiped as “Mama Uati” in ancient Egypt, and as Mami (Uati/Aruru) in ancient Mesopotamia, where she is first addressed and immortalized in prose by the gods. (Massey 1992, p. 204, 227). Mami Uati, is an ancient and sacred name which remarkably, after thousands of years, has survived as “Mami Wata,” in West African Vodoun and other African religious systems, having changed little in its original phonetic form. In Togo, West Africa, and in the United States, the priestesses of Mami Wata are called Mamisii (Mamissi, Mamaissii, Mammisi). Certain paths of high-priestesses who are called to open an Egbé (spirit house) are known as “Mamaissii-Hounons” which translates as “queen of the ship,” or literally “mother wisdom” (Alapini 1955, Massey 1994, p. 227, Rosenthal 1998, p. 116-117). This is an ancient name probably having its etymological roots in ancient Egypt, where we find the name Mammisi meaning “motherhood temple,” as the sacred shrine where the queen/ priestesses gives birth to spirit. (Walker 1983, p. 572-573). Mammisi temples are traditionally built as attachments to the main shrines. Above, temple of Hathor at Dendera, (Egypt) The names “Mammissii” and “Hathor” are actually one and the same, both symbolizing the sacred womb which only part of their sacerdotal function was giving birth to the solar gods who ruled as kings. These temples are credited to the Greco-Roman Ptolemaic period. However, they were actually refurbished by them, or are exact copies of the more ancient temples designed by the indigenous (black) Egyptian themselves. In a political ploy probably designed to legitimize her reign, after inheriting her father’s expanding colonial kingdoms at the age of 17, the Macedonian (Greek) Cleopatra IV and her 10 year old brother (Theos Philopator)-Ptolemy XIII, installed as the new rulers of Egypt, in imitation of the African queen mothers, reputedly built herself a (now destroyed) Mammisi shrine at Erment (Upper Egypt), when giving birth to her first son. She even had inscribed in her shrine the traditional priestly attributes including depicting herself giving birth to Julius Caesar’s son, being assisted by the seven Netjers (divine African ancestors, including Isis and Osiris). However, lacking the ancestral connection to the divine spirits, she thought she could fake it by trying desperately (without success) to obtain the sacred prophetic poems of the Eastern Masses, authored by the great Sibylline (Mami) prophetesses’. Undeterred, she ordered her conquered African subjects to address her as the “New Isis.” Ironically, she met her [demise] when she was fatally bitten by one of the sacred asp (serpents). (Walker 1983, p.573, Britannica 1974, Vol. 6, p.484, Vol 8, p. 386, Vol. I p. 261, VIII p.282, Nicholson, p.264,269,Lindsay 1971, p. 384). On a basic level, in the family, Mami Wata’s primary role in the life of the devotee/initiate is “healing,” by helping the initiate to achieve wholeness both spiritually, and materially in their lives. Mami is also responsible for protection, emotional, and mental healing, spiritual growth/balance, and maintaining social order by assuring that sacred laws imposed on both the initiate and the family in which she/he lives is maintained. When these requirements are met, Mami often blesses the initiate (and family) with material wealth. “wealth” being relative to assuring that the family has the basic needs of survival, such as shelter, food, clothing, medicine and funds to maintain them. Or, wealth could mean achieving great riches through some profession or spiritual gifts the initiate might possess. 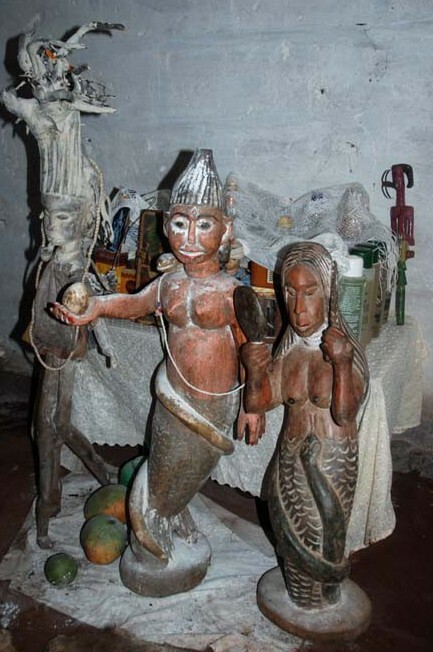 Far from being the over-embellished, “seductress” or “god/dess of love” so over-emphasized by western anthropologists, Mami Wata is primarily known to produce Africa’s great seers, prophetesses, prophets, scribes, herbalists, healers, orators, mystics, etc. They are also known as the protector of mothers and children, and of abused women, and the “bringer of fertility” to both men and to barren women. They are even known in ancient history as being the “protector of sacred prostitutes”, meaning those African priestesses whose role was to subsume the “uncivilized invader/foreign groups” by “spreading the ache” of the African [gods]. … boy, am I glad I can read for myself. Very interesting.